Have any Forum users tried this? Share your experiences and questions. 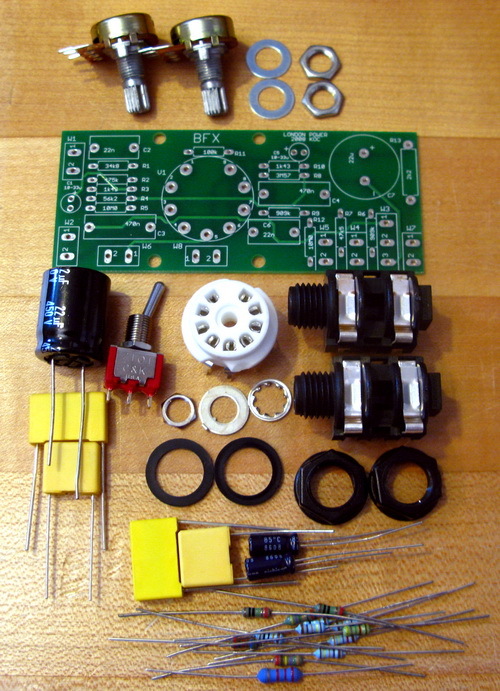 Kit form of the "Best All-Tube Effects Loop" from the book The Ultimate Tone. The 'send' is buffered, eliminating problems with long cables to your effects. The return input has enough gain to support pedals used in the loop even if the loop is inserted in a high-level signal point in your system. Quiet! So quiet the loop can be used at the front end of your guitar rig. Use any 12A_7. The whole board + tube (tube not included) can be contained in the chassis. I'm presuming something like this will be used? Your linked bracket is too large and will foul on traces on the board. The space around the holes will accommodate keystone 612 and 621 brackets - the 612 has untapped holes which would allow you to use metric bolts. The 621 has 4-40 tapped holes. The keystone brackets might not allow mounting in 1U unless the chassis itself is a but tight to the 1U dimension as the brackets add some height to the 1.5" (38.1mm) of the PCB. An alternative mounting is to make your own brackets, since they are pretty small and easy to fabricate. Drill the holes first then use tin snips to cut the metal and bend with pliers. This allows a much tighter fit of the bottom edge of the PCB to the chassis floor. A more elaborate form of rolling your own would be to copy the hole centres and tube socket centre onto a flat piece of aluminium, drill the holes and cut out a hole to clear the tube, then bend the piece so there is a large foot that can be bolted to the chassis. use standoffs to secure the PCB to the aluminium shield. Hi. Thank you very much, I've found a supplier for those parts in the UK. Hopefully do the swap with out too much trouble! Thanks again, Adam.